Harbour Senior Research Analyst Oyvinn Rimer recently took a trip to China, to investigate the state of the Chinese consumer milk market. Disclosure: Harbour owns a2 Milk in a number of portfolios. Two weeks ago, I was back on the road in China primarily focusing on the Chinese consumer and the infant milk formula market, but we also met with a range of experts in the wine industry. At a high level, it is hard to ignore the state of the Chinese consumer. Consumer confidence is at multi-year highs, personal income growth is healthy, household balance sheets are very strong (30-40% savings rates over decades is the key reason for this) and, more importantly, consumer willingness to spend is improving (consumer confidence reached its highest level since 1993 this February and Nielsen’s willingness to spend component surged in Q4’17). All this bodes well for consumer products, particularly premium imported products that form part of the current trading up Chinese market thematic. 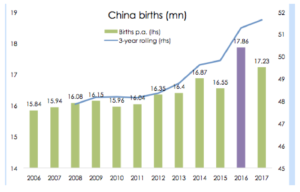 Alongside a buoyant consumer outlook, the infant milk formula market (IMF) is currently experiencing very strong growth, largely attributed to the removal of the one child policy in 2015/16. Whilst births in 2016 increased by 1.3 million (with 17.9mn babies born), the biggest take-up of infant milk formula only happens after 12 months (i.e. Stage 3 products), so the market impact is only coming through now. We estimate that 60% of a2 Milk’s IMF sales are Stage 3. The consensus amongst industry contacts that we met with is for the IMF market to grow by 20-30% in 2018. As you will be aware, we have owned shares in the a2 Milk Company for a long period of time in client portfolios; our regular China visits are part of the ongoing channel checks and research that Harbour commits to for our research-driven approach. It was therefore pleasing to observe the new multi-channel strategy of the a2 Milk Company playing out. After having only recently launched into the offline Mum and Baby Store channel with its Chinese-labelled product, our expectation was to see limited footprint. However, we observed a2 Platinum products in all Mum and Baby Stores that we visited. According to industry experts that we met with in China, the Mum and Baby Store channel is the largest sales channel of infant milk formula (IMF) and currently represents 50-60% of total infant milk formula sales in China. Compare that to e-commerce (a2 Milk’s traditional channel to market) having approximately 20-25% share. Given its size, it is an obvious next step for a2 Milk to move into the MBS channel. Whilst China is the lead innovator in e-commerce globally, the Mum and Baby Store channel (offline) represents an important part of the IMF market and is a place where new parents often go for more than just a tin of formula. Mum and Baby stores provide additional services such as: nutritional advice, sleep consultations, baby bath services, haircuts, swim classes and larger stores might have an in-house playground. All these additional value-add services are reflected in the price of the final product, often trading at a significant premium to that of e-commerce alternatives. Despite the Mum and Baby Store channel having typically higher costs to serve, the price differential across channels assists margin stability across channels. Even within the Mum and Baby Store channel, different brand-owners use different models to achieve store penetration. Most of the global multi-nationals prefer to spend significant resources on marketing to build brand-awareness and to create a demand-pull that ensures limited reliance on distributors to push your product into stores. Others, including some of the large domestic Chinese companies, pay a larger margin to distributors to ensure quality distribution and store penetration. We believe that a2 Milk will opt for a hybrid model where they pay above industry margins to incentivise distributors to open doors into high-quality stores. On top of that, the company has signalled that they will ramp up marketing expenditure this year to support the brand awareness campaign, which should benefit both the online and offline channels. Coming back to the point of how quickly China innovates and develops, we also learned about a new sales channel on this trip – the Hipac channel. This is an online to offline or B2B2C channel that marries the best of online and Mum and Baby Stores into a fast-growing channel, having achieved somewhere between 60K and 80K stores, primarily benefiting regional China in Tier 3 cities and below. The Hipac channel specialises in providing imported baby products that are popular on e-commerce platforms to jurisdictions that may otherwise have limited access or have trust issues with the authenticity of the final products. Because the Hipac channel has direct distribution from online platforms to the Hipac stores, the legitimacy of products is as good as online, which is a key selling point of the Hipac channel. It is all about a food safety premium and customers in lower tiered cities, whilst on lower incomes, are prepared to pay similar premiums for quality products subject to trusting the authenticity of the product. The Hipac channel is developing a solution for this market. We believe this channel is likely to benefit brands and products, such as a2 Platinum and Bellamy’s and could potentially become a third meaningful channel alongside Mum and Baby Stores and online. The difference is that this channel reaches regions that otherwise were unlikely to be on the agenda for companies like a2 Milk in the foreseeable future. In terms of consumer awareness for a2 Milk, our trip suggests that the a2 Milk Company is known to many, but the A1-free proposition might not be fully understood. One industry insider (working for a competing brand) thought it contained an A2 additive rather than being a natural product free of the A1 protein. The ongoing awareness campaign and step-up in marketing is likely to gradually improve this understanding of the proposition. The company announced at the 1H18 results that they will be embarking on a ramp-up in marketing spending to support the Mum and Baby Store roll-out. We believe that this investment will also benefit other channels as more consumers learn about the proposition and could see a new demand-pull that goes beyond the organic growth that the company has experienced thus far. We will keep monitoring progress going forward. alternatives that we observed on shelves (Meadow Fresh, Theland and Devondale). Given the large increase in babies in late 2016, there is a significant ramp-up in short-to-medium term demand for IMF products – particularly Stage 3 and beyond. Longer-term, the trading-up demand underpins a strong backdrop for the premium segment – a2 Milk is nicely positioned in the strongest segment (premium) in a growing overall market. On regulation, we were surprised by the change in sentiment among industry participants – companies and consultants alike. Whilst there was an announcement made at the National People’s Congress in March that a regulatory super-agency will be formed by consolidating multiple agencies, the consensus expectation is that the heavy lifting has already been done. In fact, with one agency in charge, the industry expects a simplified framework with more efficient processing of applications and increasingly consistent messaging ahead. A robust regulatory framework to ensure food safety and to close large tax-loopholes has been implemented over the last few years, with modifications happening on an ongoing basis (for example, there is an increase in the tax-free revenue that cross-border e-commerce merchants can make coming into effect on 1 May 2018). The view of industry participants on pending regulatory changes has in the past provided a good directional indicator of where regulation is going. This recent shift in sentiment is noteworthy and whilst we expect regulation to stay tight (perhaps the tightest infant food regulation in the world), we do not foresee any additional regulatory hurdles anytime soon. Since early January 2018, we have noted that global power-house Nestle has also launched an A1-free infant formula series in China (trading under the Illuma brand which is produced by Nestle’s Wyeth). This is the first product to be launched by a major global consumer company and is a significant accelerant for the proposition of the category. We expect consumer awareness of the A1-free proposition to increase significantly as Nestle and Mengniu (UHT) educate a broader part of the market than what a2 Milk could dream of if going it alone at this point in time. Whilst it is fair to ask whether this product should be viewed as competition and potentially erode a2 Milk’s margins, our strong view is that the A1-free market is likely to grow and a2 Milk is positioned to disproportionately benefit from this growing category. As we have observed for a decade now, both in the traditional A1 market and the organic market, once you are positioned as a premium offering that consumers can relate to, you can grow your sales and margins irrespective of how many competitors enter the market (i.e. Danone, Mead Johnson and Friesland Campina). Nestle/Wyeth is perhaps the only company among the Big 4 that is currently underperforming the overall market growth in China and they are pushing hard to have customers trade up from their existing Illuma products into their Illuma Organic and Illuma Atwo products, to address the market share losses. Whilst it is still early days, we expect Nestle to have some traction in switching customers onto their new, higher-margin products. From our conversation with sales consultants, this switching is likely cannibalising internal sales, but at improved margins. We do not know what consumers think about Nestle’s messaging around their majority A1 business, but we do not expect Nestle to take sales of a2 Milk as most of the customers who buy the a2 Platinum product know which one is the original A2 product. In-store conversations suggested that most of the a2 Platinum customers would by-pass the Illuma stand all-together and head straight to the a2 Milk stand for their desired product. Additionally, both a2 Milk and Nestle (Illuma Atwo) entered the Mum and Baby Store channel about the same time, and most of our channel checks suggest that a2 Milk is experiencing good sales growth – we think even better than Nestle (on a per store basis) despite much less marketing reach. As always, there is a lot to consider when investing in the infant formula sector. From an a2 Milk shareholder’s point of view, this most recent trip is perhaps the most encouraging we have ever undertaken in China. The overall IMF market is growing at multi-year highs and well into the double-digits, with an above-average growth rate in a2 Milk’s key segment – Stage 3. The regulatory environment is getting clearer and better understood, with no major curve-balls expected in the near-term. The pricing (and margin) environment is robust for premium products and a2 Milk has exceeded our expectations with the significant distribution foot-print in the offline MBS channel. Weighing up our latest findings alongside our ongoing research, the outlook looks very promising for continued growth. Momentum in online channels is on-going and the launch into the physical Chinese market looks stronger than our initial expectations. Additionally, the potential growth from the U.S. expansion and the Fonterra partnership is not yet on investors’ minds – we expect newsflow on these growth options to complement the Chinese newsflow in the years ahead, as a2 Milk establishes itself as a major nutritionals company on the global stage.